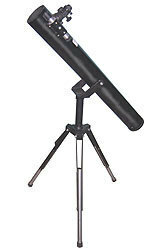 Sky Probe-I is a telescope which the beginner as well as the serious star gazer have preferred alike. A generous 125mm-aperture mirror is able to pick up light even from the very faint celestial wonders to bring them to the wide field 25mm f.l. coated achromatic eyepiece – bright and clear. Jupiter’s cloud belts and the great red spot are within its reach. Its satellites casting a shadow on the planet’s surface are seen to be believed. The Cassini’s division in Saturn’s rings and its satellite Titan make a spectacular view. There is no end to the list of what this telescope can show you. Tracking sky objects is simplified with its advanced, more sophisticated, heavy-duty equatorial mounting – a feature only professional and seasoned amateurs desire on their scopes. 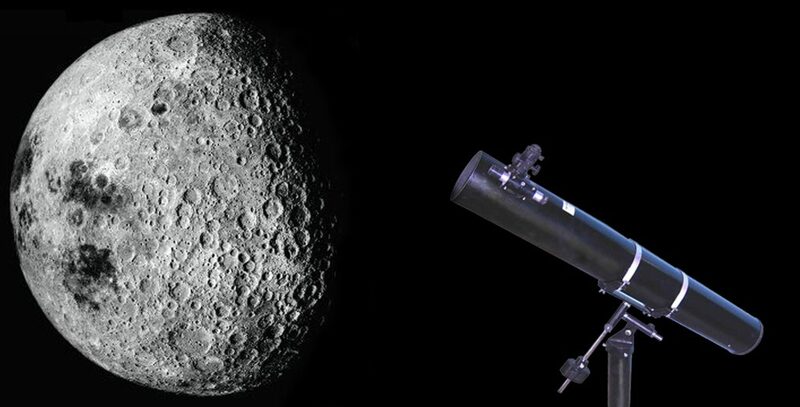 Included is a camera attachment that allows you to take photographs with your telescope using any camera. Guaranteed to provide you years of enjoyment and learning. Get absolutely free two books that will take you a long way in sky probing – Treasures of the Night Sky and Sky Guide and Star Atlas. Mirror dia. : 5″; Focal length: 42″; Power range: 42x, 84x, 126x, 168x, 252x; Tube dia. : 6.25″; Length: 45″; Weight: 13.5 kg. Price: Rs 12,500/- plus Rs 1800/- packing and forwarding. Setting circles to enable you to locate sky objects when their coordinates are known. Price: Rs 500/-. Total cost with all the three accessories: Rs 16,600. 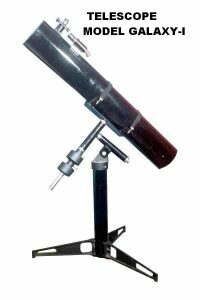 If you are looking for a telescope with same capabilities as Sky Probe-I but on a simple and light weight Altazimuth mount, then Sky Probe-II is your answer. A generous 125mm-aperture mirror installed in this telescope is able to pick up light even from the very faint celestial wonders to bring them to the wide field 25mm f.l. coated achromatic eyepiece – bright and clear. Jupiter’s cloud belts and the great red spot are within its reach. Its satellites casting a shadow on the planet’s surface are seen to be believed. The Cassini’s division in Saturn’s rings and its satellite Titan make a spectacular view. There is no end to the list of what this telescope can show you. Mirror dia. : 5″; Focal length: 42″; Power range: 42x, 84x, 126x, 168x, 252x; Tube dia. : 6.25″; Length: 45″; Weight: 11 kg. Price: Rs 12,000/- plus Rs 1500/- packing and forwarding. Great image brightness and depth of vision are the main qualities of this telescope. Galaxy-I boasts of a 153 mm diameter mirror, has almost one and half times more light grasp than our favoured 125 mm mirror dia. Sky Probe model. Not just that, the truly three-dimensional effects seen while observing the Moon or the planets is remarkable indeed. Available in a wider and higher magnification range with two wide field coated achromatic eyepieces of 25mm and 17mm focal lengths, this is a class above Sky Probe. It also has the distinction of being the “Standard Six Inch” telescope, which many books suggest as the ideal size for amateur astronomy. The short f/ ratio (f/7) makes it the ideal rich field telescope for deep sky study. On a heavier equatorial mounting, the overall dimensions are nearly the same as the Sky Probe-I. Also included are camera attachment for photography, books Treasures of the Night Sky and Sky Guide and Star Atlas. Mirror dia. : 6″; Focal length: 42″; Power range: 42x, 84x, 126x, 168x, 252x, 336x; Tube dia. : 7″; Length: 45″; Weight: 15 kg. Price: Rs 20,000/- plus Rs 2000/- packing and forwarding. Same aperture, image brightness, resolution and depth of vision as that of Galaxy-I, Galaxy-II is identical to Galaxy-I except that it comes with a simple easy to use Dobsonian mount. Free books include Treasures of the Night Sky and Sky Guide and Star Atlas. The short f/ ratio (f/7) makes it the ideal rich field telescope for deep sky study. 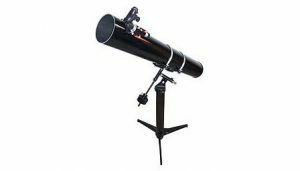 Supplied with a lightweight wooden Dobsonian mounting, even beginners feel comfortable with this telescope. Mirror dia. : 6″; Focal length: 42″; Power range: 42x, 84x, 126x, 168x, 252x, 336x; Tube dia. : 7″; Length: 45″; Weight: 12 kg. Price: Rs 19,000/- plus Rs 2000/- packing and forwarding.